BEIJING — China's military says its first aircraft carrier group has carried out a series of fighter launch, recovery and air combat exercises in the Yellow Sea ahead of a scheduled voyage farther afield. 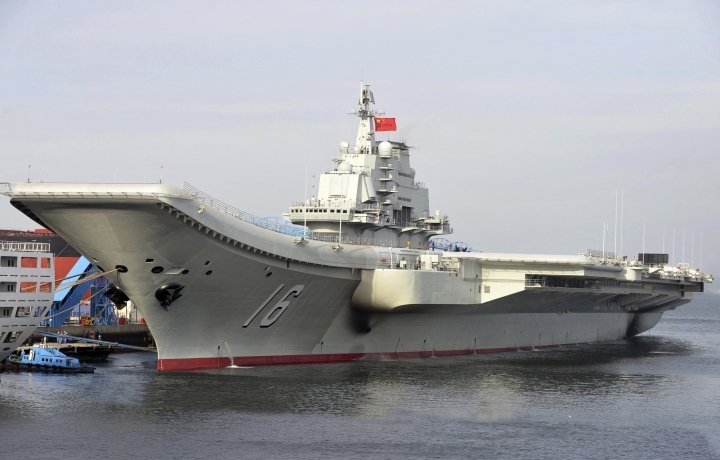 The Defense Ministry announced late Friday that the Liaoning carrier group conducted the drills in the Yellow Sea in recent days, adding that the group "as a next step will conduct scheduled cross-sea training and tests." The ministry did not specify its destination, but its "cross-sea" wording has prompted speculation in the Chinese media that the warships could soon sail to the contested South China Sea. The state-run Global Times newspaper quoted a well-known military analyst on Saturday as saying that the South China Sea would be an "ideal" next location because joint exercises could involve with troops on reefs controlled by China. The growing capabilities of the carrier group and its movements have been closely watched since the Liaoning was declared combat-ready last month. Tensions have mounted in the South China Sea, where the U.S. and China accuse each other of engaging in a dangerous military buildup. China claims nearly all of the sea and is pitted against smaller neighbors in multiple disputes over islands, coral reefs and lagoons. The U.S.-based Asia Maritime Transparency Initiative think tank said this month that satellite imagery showed China building large anti-aircraft guns on artificial islands in the contested waters, where China has also laid airstrips, built communications facilities and deployed suspected missiles. China has characterized its moves as defensive in nature and accused U.S. warships of making provocative passes through the region. The Liaoning, commissioned by the Chinese navy in 2012, first sailed to the South China Sea in 2013, when it docked at a navy base near the Chinese holiday resort of Sanya. The vessel at the time was not outfitted with a full aircraft complement. The Liaoning carried out its first live-fire exercise last week, with the military releasing video footage that showed Chinese J-15 fighters launching missiles and hitting targets. State broadcaster China Central Television on Saturday showed footage of the Liaoning launching a large contingent of J-15 fighters. The navy's top commander, Adm. Wu Shengli, was shown onboard watching the exercises. Beijing has said the carrier, built from an incomplete hull from Ukraine, would be used mostly for training and research as it prepares to deploy its first home-grown carrier, but it is widely viewed by analysts as a strategic piece in China's increasingly assertive claims in the South China Sea.